Notice - As of February 22, 2019, GreySave will once again be processing applications from adopters wanting to adopt a greyhound as an only dog. Please note that the hype around there being thousands of greyhounds needing immediate adoption is just that - hype. The track shutdowns are happening over a two-year timeframe; breeding is halting, and kennels are releasing the dogs in a slow-drip fashion with adoption groups in the closest proximity getting first dibs. In fact, the track closures in have inhibited adoption groups on the West Coast from obtaining greyhounds. Our Mission - GreySave's main goal is to find the right home for the right dog--and to find the right dog for the right home. To help GreySave do this, please fill out this application completely and accurately, with as much detail as possible. Note that providing a less than ideal answer to a question below doesn't necessarily mean that you will not be allowed to adopt a greyhound. The Adoption Representative who contacts you will use this application as a basis for dialogue and creative solutions. Greyhound adopters can anticipate 10 or more years of joy with their dog. Because of this, adopters need the financial ability to care for their dog as needs arise, and need to provide stable and secure living arrangements. Students, though they may be responsible persons, often have little money, move frequently, and share homes with other students that come and go. As such they may not be able to offer sufficient long-term financial support and home stability for a greyhound. The alone time issue and greyhounds. Greyhounds have been raised with hundreds of other greyhounds and with people around for many hours of the day. In spite of this fact, some people have a a BIG mis-conception about them and their companionship needs. Their "couch potato" reputations does not help eradicate the mis-conception that they can be left alone for many hours. Greyhounds need their people! So before we adopt a greyhound to anyone we will need to be sure that they will not be left alone for long hours. In general, GreySave does not adopt to people who are gone more that 6 hours any day of the week, live in a residence without a dog door and don't have a solid plan for their greyhound to get walked while you are gone. And if you are in a home with a dog door and are gone more then 6 hours we will highly recommend you get a dog walker or you get two greyhounds. Be sure to read our "Adopt section" on this website before completing the application below. If you are a renter and are gone more than 6 hours any day of the week please tell us your plan to get your greyhound walked part way through the day. 32. 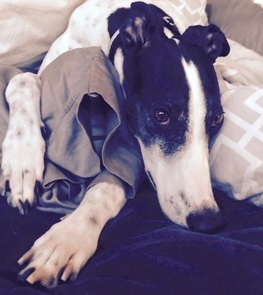 What circumstances would justify giving up your greyhound (or any other dog)? Please review all your answers carefully and make sure all questions are answered before clicking submit. Please allow at least 3 days from receipt of application for a response from GreySave. If you have not received a call within 3 days, please contact the GreySave voice mail line at 866-GREY-SAVE (866-473-9728).